As your leading stock photography agency offering you a library of 80 million diligently curated images, vectors and videos, and growing daily, we are committed to improving your user experience when you visit our website. Here are some of our latest updates to make searching for images more efficient and satisfying. Finding the image you need is no longer a never-ending chore. Our refined search tools allow for greater control of the images you want to see. Become an advanced user with our restyled filters and cut short your time spent looking for the right pictures. We understand the need to have a better view of the details of an image before presenting it to a client or licensing it. 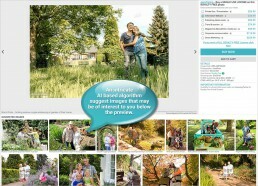 That is why we have enlarged our image preview sizes to aid you in your selection task. We constantly enrich our websites with enhancements developed in-house by our IT and design team, so stay-tuned for further developments.